Embedded in the asteroid belt is a dwarf planet that features a 3-mile-high (5 kilometers) pyramid-shaped mountain and intriguing bright patches that scientists are still trying to understand. This world's name is Ceres, and it is currently under scrutiny by NASA's Dawn spacecraft, which began orbiting the dwarf planet in March 2015. 1. Why doesn't Ceres have a family of "ceroids" associated with it? The protoplanet Vesta, another large body in the asteroid belt that Dawn examined from orbit, has a family of asteroids that orbit near it. These "vestoids" are believed to have been blasted out by a powerful impact long ago, which created a huge crater that was first spotted by the Hubble Space Telescope when Vesta passed close to Earth in 1996. In 2011, a new type of asteroid was identified that apparently originated from Vesta's interior somehow. (The asteroid is called 1999 AT10). Ceres, like Vesta, is a long-time inhabitant of the asteroid belt. It also has many craters on its surface. Why haven't scientists seen any "ceroids" associated with Ceres? Figuring out this answer could yield insight into the different formation histories of Vesta and Ceres, Russell said. 2. Why have we seen no meteorites from Ceres? There's another thing that Vesta has that Ceres doesn't: meteorites that have fallen to Earth. "Vesta informed us of herself by showering Earth with meteorites -- the Howardites, Eucrites and Diogenites," Russell told Space.com. "Six percent of all the meteorites seen falling to Earth come from Vesta, but we know of none from Ceres." The mysterious lack of Ceres meteorites makes it harder to learn about the internal composition of the dwarf planet, because this composition cannot be studied directly. Instead, Dawn must make inferences from orbital observations. Scientists can also gain insights through modeling Ceres' formation, and comparing the object to other bodies in the solar system. 3. Where is the water vapor on Ceres coming from? In early 2014, scientists announced that they had spotted signs of water vapor on the dwarf planet. This discovery -- which was something of a surprise, because asteroids in the main belt are not known to spout plumes -- came courtesy of Europe's Herschel space telescope, which did not see the water vapor every time it looked at Ceres. At the time, scientists suggested that the water vapor occurs when parts of Ceres' icy surface get a little warmer, as the dwarf planet gets closer to the sun. In 2015, Dawn scientists observed a haze above Occator crater, suggesting that this feature could be an active source of water vapor on Ceres. But it's still unclear where the plume reported in 2014 came from. 4. Where did Ceres form? "When we first looked at the surface of Ceres, it was covered with ammoniated phyllosilicates," Russell told Space.com in an email. "But ammonia contains nitrogen, which is condensed in a very cold environment." This observation raises intriguing questions about where Ceres formed, Russell said. For example, perhaps the dwarf planet coalesced in the cold, dark depths of the outer solar system and then migrated inward to its current position somehow. Right now, Ceres orbits the sun at about 3 astronomical units (AU); 1 AU is the Earth-sun distance, about 93 million miles (150 million km). "Was it ever this cold at 3 AU, where Ceres is now?" Russell added. "Or did Ceres come from far out in the solar system, where it is cold today?" 5. What is the true nature of those bright spots on Ceres? 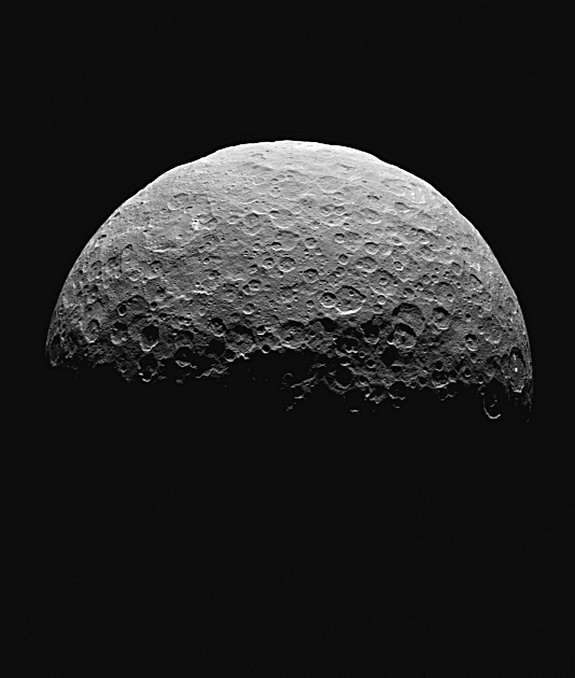 The bright spots on Ceres made the dwarf planet famous even before Dawn entered orbit. The mystery of what these spots are -- ice, salt or something else -- even inspired an xkcd comic, which (spoiler alert) joked that perhaps it was evidence of a past visitor. The massive public interest in the bright spots inspired NASA's Jet Propulsion Laboratory in Pasadena, California to create a poll allowing people to vote for their favored explanation --volcanoes, geysers, rocks, ice, salt deposits or other. In December 2015, results released in the journal Nature gave a bit more insight into what the bright spots are. Dawn identified more than 130 bright areas that are mostly associated with impact craters. Inside these craters appears to be a type of salt (magnesium sulfate) called hexahydrite. The theory is that the salt was unearthed when asteroids hit the surface. When the water ice in these craters sublimated into space, the salts were left behind. But mysteries still abound concerning that theory. For example, Dawn scientists suggested at a March 2016 press conference that Occator Crater -- where the biggest bright spots are -- is apparently too old for the theory to work. The thinking is that the salts should have been covered over in the 80 million years since Occator was formed. Dawn investigations continue in an attempt to resolve the findings.